The biggest political story of the week in the US is undoubtedly the Supreme Court's decision to uphold President Obama's contentious health care bill, aka Obamacare (see video). The Cagle Post has a collection of cartoons on this this topic. This one is by Mike Luckovich, who draws cartoons for The Atlanta Journal-Constitution. The Grim Reaper, the black-cloaked, scythe-wielding personification of death, is reading the news of the Supreme Court's ruling. After realizing that better health care will mean fewer deaths (in the short term at least! ), he comments, "I'm bummed". 1. In informal American English, bummed means disappointed or annoyed. 2. If a court of law upholds a legal decision that has already been made, it decides that it was the correct decision. The cartoonist is making an ironic comment on the attitude of those who opposed Obama's health care bill, most of whom were Republicans. His message seems to be "how can univeral health care be a bad thing if it saves lives?". Euro zone leaders go home from a crucial summit after bolstering their crisis-fighting powers but analysts say differences between them remain. Joanna Partridge reports from Brussels. REPORTER: They met divided - and under pressure to save the euro from disaster. European leaders departed Brussels slightly more united in their plans to tackle the euro zone crisis - and having delivered some surprises. They agreed on emergency action to help Italy and Spain bring down their borrowing costs. Key to this will be allowing their rescue fund to inject aid directly into struggling banks from next year and intervene on bond markets. They also said they would create a single body to supervise euro zone banks - based around the ECB - in what's seen as a landmark step towards a European banking union. ECB President Mario Draghi welcomed this, but said any loans to banks will come with conditions attached. EUROPEAN CENTRAL BANK PRESIDENT MARIO DRAGHI: "Of course both these things have to be accompanied by strict conditionality otherwise they're not credible and they will not achieve results for which they're being created." REPORTER: Many saw the bank loan deal as a political victory for the Italian and Spanish leaders over Germany's Angela Merkel. French President Francois Hollande insisted it was a joint effort. FRENCH PRESIDENT FRANCOIS HOLLANDE: "I'm quite concerned by the fact some people are crying victory and others might feel like they have to justify any sort of defeat. What happened was a compromise, it evolved. And Mrs Merkel, just like others, participated in seeking it, and in the desire to help and consolidate the euro zone." REPORTER: Despite the compromise, differences remain and Merkel once again made clear she would not support euro bonds. GERMAN CHANCELLOR ANGELA MERKEL: "Concerning this report we spoke from different positions, and my position on this question has not changed." REPORTER: As the European leaders go home from this Brussels summit, many may well be leaving feeling quite satisfied with how things progressed. For once it does appear to be the case that they achieved more than many had hoped at the outset. But Pieter Cleppe from Open Europe believes the leaders have only made limited progress. PIETER CLEPPE: "It's again a very short-term perspective that this gives. It allows them to kick the can down the road on the very short-term, so it's not a sustainable solution for the euro zone's problems." REPORTER: The politicians have once again bought themselves some time - and Spain and Italy some breathing space. Chances are they'll be holding another meeting like this, in just a few weeks' time. Joanna Partridge, Reuters. If you dump someone, you end your relationship with them. • A new biography reveals that singer Adele was dumped by her bisexual lover for a gay friend. The breakfast dilemma of trying to spread cold butter straight from the fridge onto toast in the morning has been voted into Britain's top five breakfast annoyances -- and Warburtons, the family baker, has created the Toastie Knife to help with this breakfast dilemma. Reaching an optimum spreading temperature of 41.8 degrees Celcius in under 30 seconds, the Toastie Knife allows you to spread fridge-cold butter straight onto toast. Watch the video to see how it works and check out this great article from Mail Online for lots of pictures and technical drawings. The knife is just a prototype (or, a PR stunt), which I’m sure will dismay many toast-eaters. There is already an array of customers on Facebook and Twitter asking where this latest toast-making technology can be bought, even as far afield as the USA. So, it seems it's just a clever spoof. I'd bet a pound of butter that the actual product never sees the light of the kitchen. Still, the story is creating a lot of buzz (including this post! ), which is what it's all about. Get your students to invent their own labour-saving device or gadget and present to the rest of the class. They could even make a video. The cartoon shows Beckham in a tattoo parlour. He asks the tattooist to turn the Olympic rings which he's had tattooed on his back in anticipation of the Games into something else. EU leaders began a summit deeply divided over how to resolve the euro zone's debt crisis, with Italy and Spain calling for urgent help to ease financial market pressure and bring down their borrowing costs. Joanna Partridge reports from Brussels. REPORTER: Europe under construction - or is it re-construction. As work took place outside on the new European Council building - the leaders inside also had some heavy duty work to do. There are growing fears the euro might fall off a precipice, some are calling this summit the most crucial since the debt crisis began. As they arrived for their 20th meeting in two years, the leader had never seemed so divided. German Chancellor Angela Merkel was concentrating on growth and employment. GERMAN CHANCELLOR ANGELA MERKEL: "We've worked through a good programme especially as far as future investment is concerned, but also for more employment opportunities, especially for young people. I hope that we will be able to pass this pact today and therefore will be able to send out an important signal in addition to the fiscal pact." REPORTER: Despite her talk of growth, she's an advocate of austerity. That position has set her apart from her neighbours. But Germany holds the pursestrings - and therefore most of the power. In recent days, Merkel has ruled out euro bonds and rebuffed pleas from Spain and Italy to underwrite their debts and bring down their borrowing costs. Brenda Kelly is from CMC Markets says the leaders can no longer be accused of kicking the can down the road. BRENDA KELLY, MARKET ANALYST, CMC CAPITAL MARKETS: "A lot of these countries are doing what is politically useful for them rather than what is useful for the euro zone as a whole - so I think that's why we are seeing the can pretty much flattened at this stage." REPORTER: Leaders of the euro zone's four biggest economies put in a lot of work to prepare for this meeting - but they still aren't singing from the same hymn sheet. Italian Prime Minister Mario Monti has already said he won't just "rubber-stamp" documents written ahead of time, and was prepared to work through until Sunday night. Italy is leading the calls for using European bailout funds to stabilise the markets, setting up a showdown between Merkel and Monti. It's not the only case of Germany facing Italy. The country's two football teams were meeting on the pitch to gain a place in the final of the European Championships - the leaders here know the stakes are much higher. Joanna Partridge, Reuters. 1. When people sing from the same hymn sheet, they hide any disagreements between them by agreeing with each other in public. 2. If you kick the can down the road, you delay a decision in hopes that the problem or issue will go away or somebody else will make the decision later. 3. If you rubber-stamp something, you approve it automatically without proper consideration. If you describe something or as warped, you mean that it is not normal in a bad way. • He's got a warped mind. • You really	have a warped sense of humour (=think strange and unpleasant things are funny). 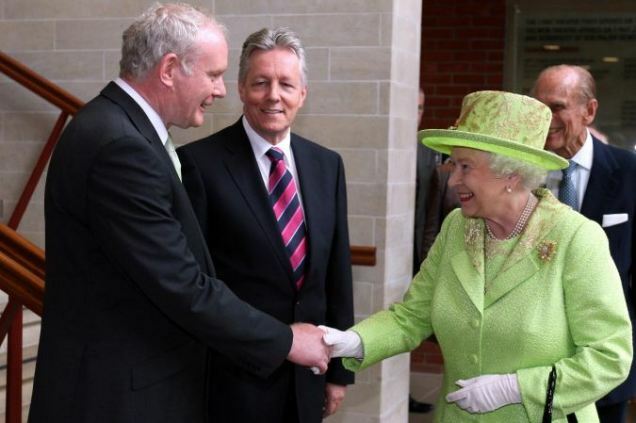 The Queen, once a prime target for the IRA, shook hands not once but twice with Martin McGuinness, a former commander of the terrorist group, in a gesture that meant every bit as much as the sovereign’s historic visit to Ireland last year. In the cartoon, we see the Queen reaching out to shake McGuinness's hand over the bombed-out wreck of a car—a clear reference to The Troubles, in which IRA terrorist attacks claimed the lives of hundreds of victims. Note the 'History' numberplate on the car, another reminder of past events. You shake hands with someone or give someone a handshake. Ahead of EU summit, German Chancellor Angela Merkel says Europe is in a serious situation. Deborah Lutterbeck reports. REPORTER: On the eve of an EU summit that could determine the future of the Eurozone, French President Francois Hollande welcomes German Chancellor Angela Merkel in Paris. Hollande says both France and Germany want to deepen ties. FRENCH PRESIDENT FRANCOIS HOLLANDE: "We are conscious of the measures that we have to take for financial stability and we want, both of us, to deepen economic and monetary -- and soon political -- union to arrive at a point of integration and solidarity." Merkel says the economic situation in Europe is serious. GERMAN CHANCELLOR ANGELA MERKEL: "The situation is serious and we have the obligation of building a strong and stable Europe for tomorrow. Significant progress has been made as far as the pact for growth is concerned. I hope that we shall be able to adopt it tomorrow. We will then have to consider the political future of European economic and monetary union. I have said, we need more Europe. We need a Europe that functions -- markets are expecting that -- and we need a Europe whose members help each other out. Thank you very much." REPORTER: Merkel finds herself in a dwindling minority in her approach to the EU crisis, backed only by the Netherlands and Finland, but she holds the euro zone's purse strings and therefore nearly all the cards. Deborah Lutterbeck, Reuters. If someone rigs an election, a job appointment, a game, etc., they dishonestly arrange it to get the result they want or to give someone an unfair advantage. • She accused her opponents of rigging the vote. English pride is restored at the World Russian Egg Roulette Championship in Lincolnshire. Tara Cleary reports. REPORTER: An eggsciting sport ... that leaves some thoroughly beaten. Egg throwing involves the tossing and catching of raw eggs at increasing distances - with mounting risks. Several eggy events took place in Lincolnshire, England. Not quite as deadly as the "Russian" version, but this game of roulette can result in, well ... egg on your face. Two contenders take turns to choose an egg from a box of six - five are hard-boiled, but one is raw. The person choosing the raw egg loses. COMPETITOR: "I could tell it was the raw egg, after I had lifted it obviously, but it was cold, the rest of them weren't cold but this one was cold but by that stage I'd picked it, it's too late to put it back." REPORTER: Organiser Andy Dunlop says Egg Russian Roulette is not just a game of chance. ANDY DUNLOP, ORGANIZER: Andy Dunlop, organizer, saying (English): "We tried last year to get it recognised by the English Sports council but they rejected that discipline, they said there was no skill involved. We are here today to prove that there is skill." REPORTER: And when it comes down to the last egg in the box, the outcome is sadly, inevitable. A win for Englishman Jerry Cullen. Who's no egghead. Tara Cleary, Reuters. 1. If you end up with egg on your face, you are made to look foolish. 2. If someone puts all their eggs in one basket, they put all their effort and resources into doing one thing, so that, if it fails, they have no alternatives left. 3. If you egg a person on, you encourage them to do something, especially something dangerous or foolish. The English may have an execrable football team, but when it comes to Egg Russian Roulette we're unbeatable (puns intended). Your grade in an examination or piece of written work is the mark you get, usually in the form of a letter or number, that indicates your level of achievement. • She achieved the highest GCSE grades at the Marine Academy last year and wants to pursue a degree in English at university. This is a guest post by Bridget Rooth. Although born a Brit, Bridget has been out of the United Kingdom for more than 20 years. She now lives in China where she runs English Trackers, an online English editing service. She blogs about the English language at Blogging Good English. Enough about the Queen, what about us? All this talk about the Queen’s jubilee has made me realise that living with a monarchy has led Brits to absorb a certain amount of monarchic language into everyday life. Take for instance “We are not amused”, a quote attributed to the longest-reigning British monarch, Queen Victoria. This use of the first person plural instead of the first person singular is known as the ‘Royal we’. There are various ways that the ‘Royal we’ is used by Brits. I have memories of my mother using this phrase to decide what we were all doing. Jokingly we might name someone ‘His Lordship’ or ‘Her Ladyship’; we might use this title when referring to someone we regard as self-important. This title is used for someone who gives commands or makes demands. It only exists in the masculine form and cannot therefore be used for a woman. [Note from the blogger: need I say more?] It is not rude to refer to someone this way, but it infers that you think they are rather bossy. It is written both with a capital and without. We even have a humorous title that we use to refer to ourselves. A mug is simple person, someone who is slightly gullible. We refer to ourselves this way when we’ve done something foolish. We tend to say ‘muggins here’ so that it’s clear we’re talking about ourselves. Now muggins here has finished this blog post, she would love to hear about any more royalty-related words and phrases in the English language, or indeed any other language, in the comments section. The French are renowned for their traditional fashion houses and sense of style. Now an Englishwoman is trying to show the benefits of shopping online with her internet retail guide, Nettement Chic, which analysts believe could help boutique brands thrive in an tough trading environment. Joanna Partridge reports. REPORTER: The French are renowned for being stylish - but it's an Englishwoman who's trying to get them hooked on online shopping. Kate Davis used to be a corporate lawyer - now living in Paris she's become an internet entrepreneur. She's set up Nettement Chic - a website which reviews some of the best boutique fashion and beauty brands. KATE DAVIS, FOUNDER OF NETTEMENT CHIC: "it's an online guide to the very best shopping on the net." REPORTER: Kate's internet shopping portal, like an online magazine, recommends brands for their products and websites. It's available in French and English and gets 1000 new unique visitors every month. KATE DAVIS: "We write about the site, what we feel about it, what we like about it. There's a link that goes through to the site itself at which point the reader leaves Nettement Chic and goes on to, you know, Net-à-Porter, Lounge Lover, Milli Millu. We also sum up the key points about delivery charges, whether you can return items." REPORTER: Kate set up the business six months ago - and online shopping's now taking off in France. The French are still behind the game with online sales accounting for just 8% of the total retail market, compared with 12% in the UK, 9% in Germany and 8.5% in the United States. One of the brands featured on the site is Lounge Lover, a clothing range created by Sylvie Gabriel. SYLVIE GABRIEL, FOUNDER OF LOUNGE LOVER: "We have clearly the same customer as a Nettement Chic visitor, because we had hundreds of visits from Nettement Chic on to our site, we had a quite a few conversions out of it, conversions meaning people buying online on our website." REPORTER: Loungelover already has concessions in department stores like here in Fenwick in central London. But when it comes to reaching out to new customers, Loungelover and other small boutique brands are increasingly concentrating on their online presence. Smaller brands are no longer looking to open bricks and mortar stores says Malcolm Pinkerton from Planet Retail. MALCOM PINKERTON, SENIOR ANALYST, PLANET RETAIL: "Nettement Chic is actually a very interesting and innovative idea actually. It does combine social media with blogging, with really a sort-of one stop shop or portal if you like, so some of the smaller players who really find it far more challenging in an increasingly competitive market to get traffic to their site." REPORTER: Many European retailers are finding trading tough. And some French shops see British High Streets as a way to grow. But smaller brands are increasingly looking online to net more customers. Joanna Partridge, Reuters. If something spawns something else, it causes it to happen or to be created. Storm forecasters are tracking a potential tropical weather system that may spawn heavy rain and flooding from the Bahamas and Florida to the Cayman Islands.